This time of year we're swamped with gift guides wherever we look so I thought I'd give you one with a bit of a difference - all these gifts are perfect for book lovers! 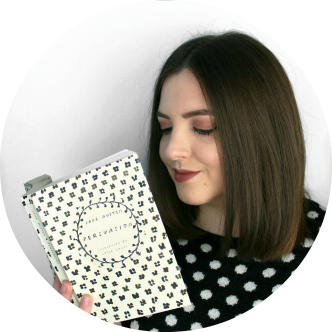 Whether you're buying for a bookish loved one, planning on 'accidentally' emailing this to your mum or you just want to treat yourself this season, I've got you covered. I've scoured the internet and tracked down the best independent e-tailers for all things bookish, at some of the best prices. Plus, stay tuned until the end to enter a bookish giveaway! Bookish subscription boxes have been all the rage this year, but most of them are US-based and those shipping fees for us UK folk aren't too pretty - enter Illumicrate! 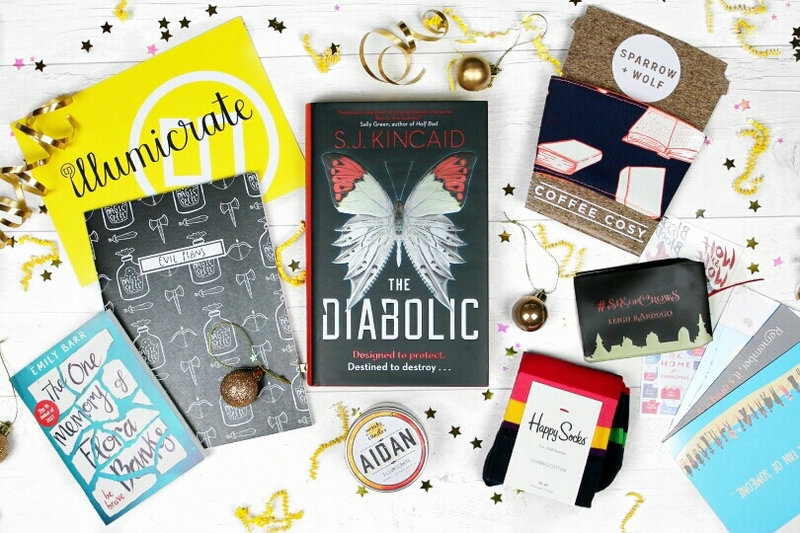 Illumicrate is a UK-based quarterly YA book subscription box - phew, that was a little wordy. Basically, you sign up and every quarter you'll receive a brand new YA release along with a whole host of bookish goodies, all wrapped up in a very instagrammable box. Book subscription boxes make a great gift because they're often a little too pricey to justify buying for yourself and they're also the gift that keeps on giving, literally. Pictured above is the November Illumicrate box which contained Diabolic by S.J. Kincaid along with a bunch of cute items like a notebook, candle, coffee cosy, socks and a load of bookish swag. Plus, readers of Sarah's Chapter can get 10% off Illumicrate with the code 'SARAHSCHAPTER'. Check out Illumicrate here. Bookish prints always make a great gift for book lovers, especially if they fit on a bookshelf. 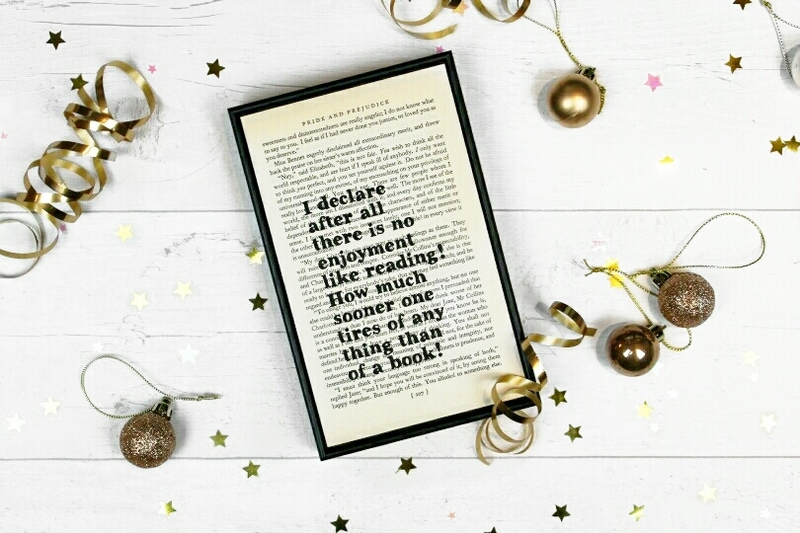 This framed book page from Bookishly is the perfect gift. Bookishly has a number of different typographical products, including bookmarks, notebooks and gift cards and a huge range of prints. The framed book pages are my favourite because they're so unique; literary quotes in a font based on hand-lettering, printed onto vintage book pages and mounted on handmade block frames. This is such a beautifully crafted item; there's no glass so you can feel the beautiful old page and because it's an original book page each one is truly unique. 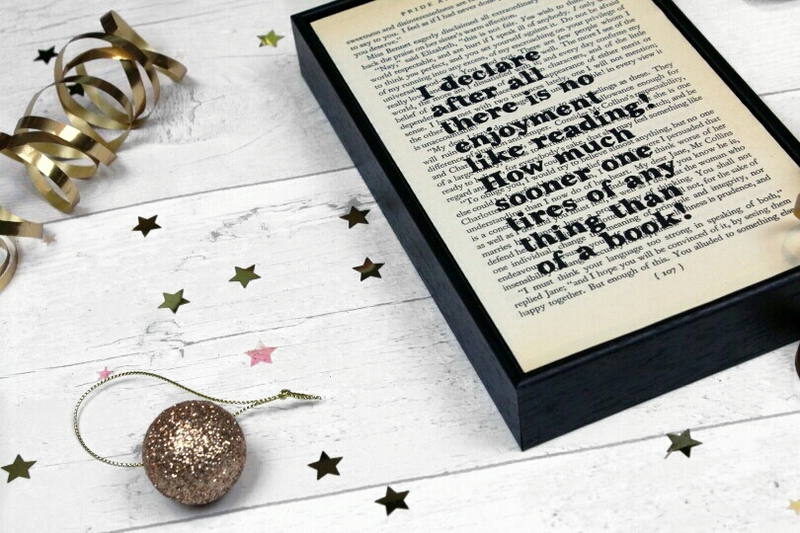 Bookishly has over 100 different framed book pages to choose from, meaning no matter who you're buying for, you're likely to find a quote to suit them! I chose this quote from Pride and Prejudice* because it's my mum's favourite book and I just know she'll love it. 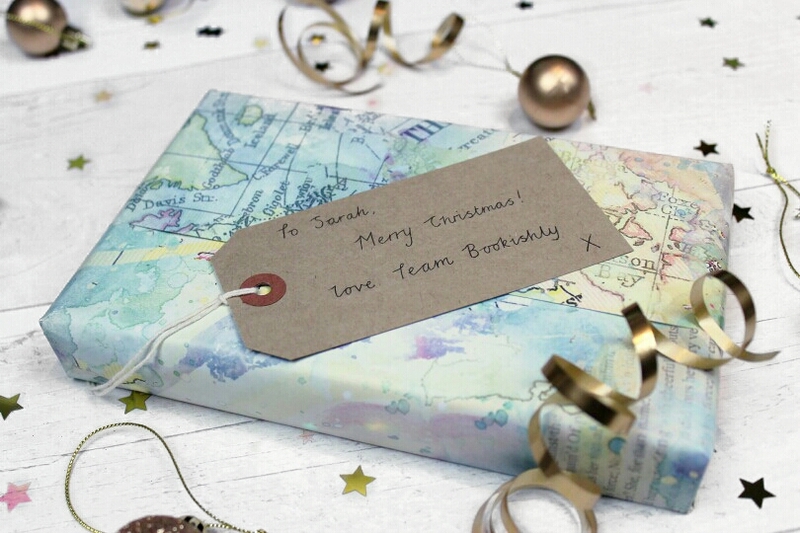 The prints come wrapped in a vintage map which means they're all ready for gifting! A trend that's come back with full force this year is pins and badges. 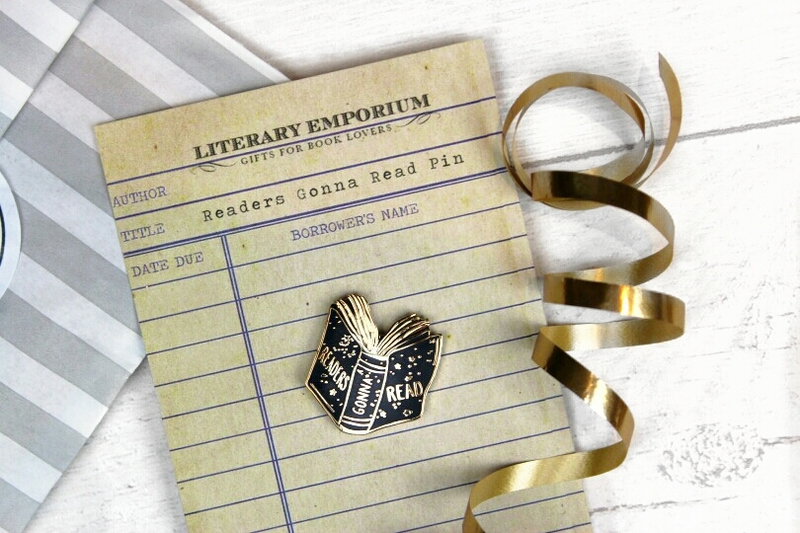 There are so many out there but Literary Emporium has the best range of bookish enamel pins* for only £7.50! 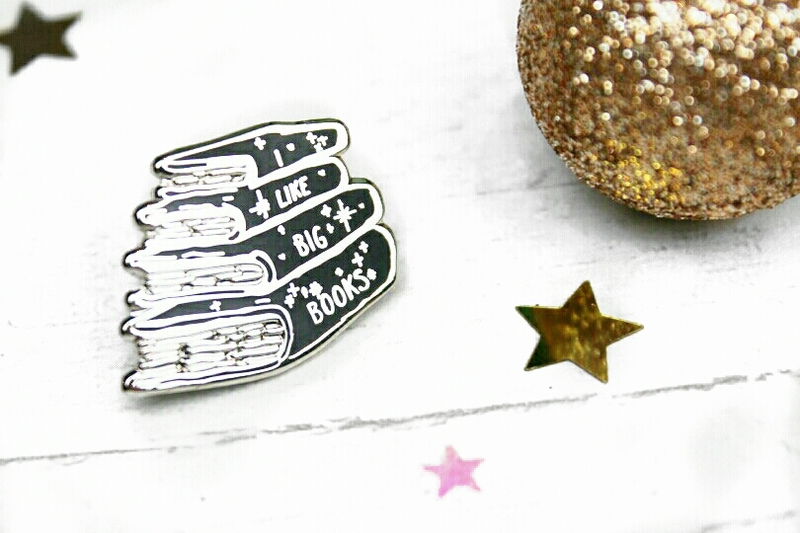 I'm obsessed with the 'Readers Gonna Read' and 'I Like Big Books' pins. I've got them pinned to my winter coat; they're so sassy and I've had a crazy amount of compliments about them. They're great quality, made from durable enamel and are super shiny. The thing with bookish products is that it's actually quite hard to find things that are both bookish and pretty. If you do manage to find something bookish it's more often than not kind of plain. Literary Emporium has everything from notebooks to jewellery and it's all gorgeous. The designs are beautiful, they come in lovely packaging and everything's super reasonably priced. These pins would make a great stocking stuffer or secret santa gift! Speaking of gorgeous, Anna of EnchantedBottleCraft on Etsy sells the most beautiful handmade bookish jewellery. Her Enchanted Bottle necklaces are so unique and from as little as £7.99, they make a wonderful gift. The necklaces are all themed and inspired by a range of books and films, from Harry Potter to A Song of Ice and Fire. Pictured above is the Lumos Bottle Necklace* which, obviously inspired by Harry Potter, is a beautiful bottle filled with pale crystals which glow in the dark! I love the idea of carrying a spell around with me, and lumos has always been my favourite as it reminds me of light in dark times. Not a fan of necklaces? You can choose to have your design as a bookmark, earrings or a keyring! Again, these would make a perfect stocking stuffer or secret santa gift. Check out the full range of Enchanted Bottles here. Next up is The Little Bookish Gift Co. which sells a mixture of handmade items and carefully selected bookish gifts. 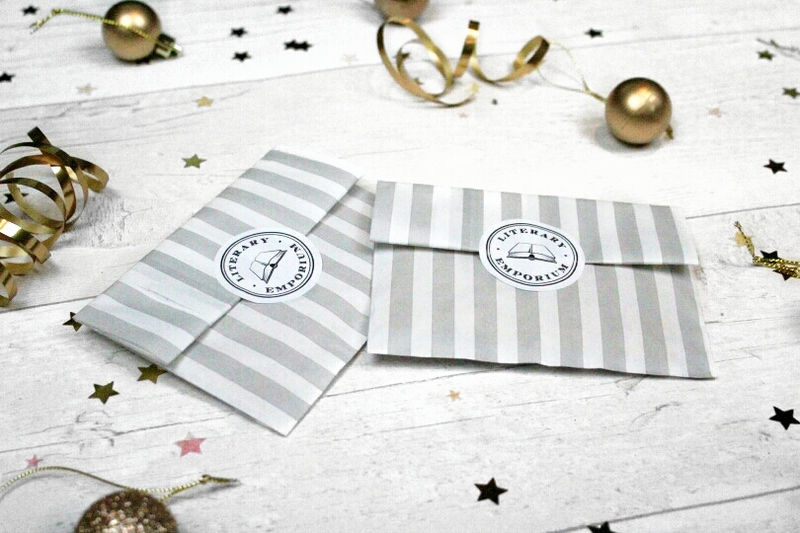 Here you can find journals, greetings cards, coasters and stationery, but I've chosen two of my favourite products to recommend to you today. My favourite items from The Little Bookish Gift Co. are their handmade wooden door signs. Pictured above is their 'Quiet Please...I'm Reading!' door sign*, but they have a range of different designs perfect for the reader (or writer) in your life. These signs are handmade using wood, biodegradable twine and old book pages. Each sign is unique and I was pleased to find that mine was made with a page from Pride and Prejudice! This is the perfect gift for someone who needs a little peace and quiet this winter. They also come beautifully wrapped which is a lovely bonus. Another perfect stocking stuffer is The Little Bookish Gift Co's 'Novel Tea'*, a pouch of five teabags tagged with literary quotes. The only thing better than a good book is a good cup of tea to go with it and these teabags are such a fun idea. Each one is tagged with a different literary quote and the tea is a delicious English Breakfast blend - the perfect kind of tea if you ask me! At just £2.50 these are the perfect extra little gift. Check out The Little Bookish Gift Co.'s other items here. 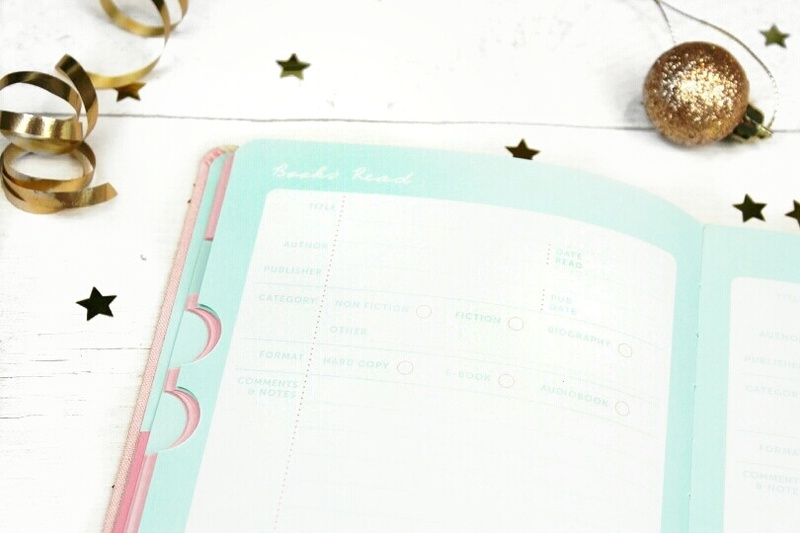 Last, but certainly not least, the perfect gift for book bloggers, book club members or just book enthusiasts: the Busy B Book Journal*. Busy B have a whole range of beautiful stationery but this journal is the perfect thing for organised book lovers. The Busy B Book Journal is divided into four individual sections; Book Club, Read, To Read and On Loan - to keep track of all your bookish needs. 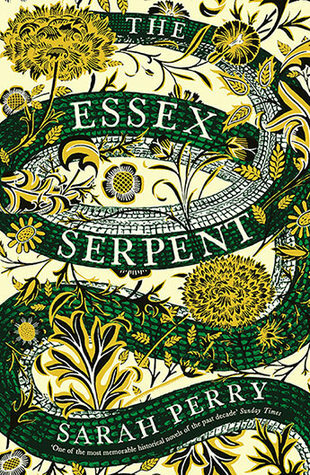 It's kind of a like a portable Goodreads and it's oh so pretty. My favourite part is the 'Read' section, where you can make a note of all the books you've read, including your thoughts on the book. As a book blogger this is so handy for me as I'll be able to refer to it when it comes to my monthly reading wrap ups and it'll save me so much time. I also love that it includes an 'On Loan' section to keep track of all the books you've lent out - a book will never be lost again! It also comes with cute page markers and name stickers for your books - things which I find super handy - all tucked into a storage pocket at the front. I'm absolutely in love with this journal and it's definitely going to stay by my side throughout 2017. Check out the book journal here. 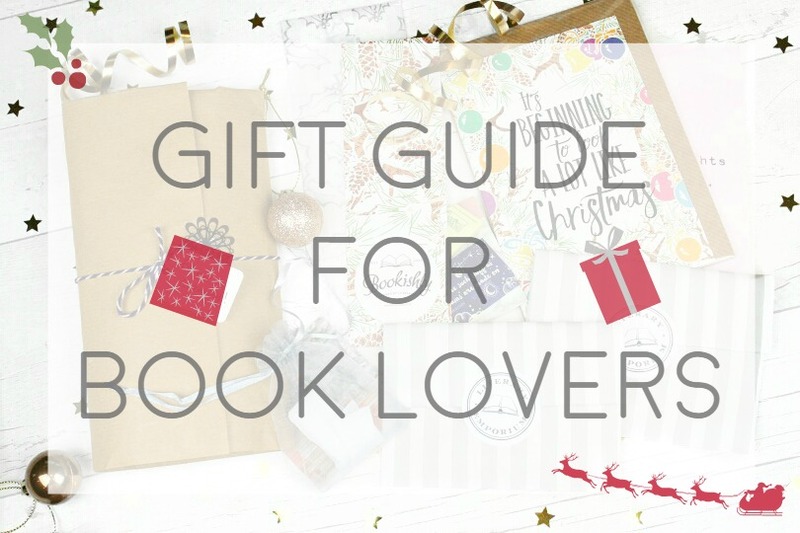 I hope you've found this bookish gift guide useful, whether you're buying gifts for yourself or others. Disclaimer: Items marked with a * have been gifted to me by the company, this in no way affects the contents of my review as I only choose to work with companies I genuinely love.